A USA Today Recommended Series! What if Beauty was cursed, and the Beast was the only one who could save her? Don't miss WITHERING ROSE, a dystopian romance from bestselling author Kaitlyn Davis that reimagines the classic fairy tale of Beauty & The Beast. This is the second book in Once Upon A Curse, a series of interconnected stand-alone novels all set in the same fantasy universe. "As the heat finally disappeared, I felt the bloom blossom in the very core of my soul, a rose just like my name—a ticking clock hidden behind a façade of beauty. From that moment on, my life would become a countdown, and all I could do was wait and watch as the petals of time slowly started to fall." Omorose Bouchene has a secret—magic. There's only one problem. At the age of seven, an earthquake struck, catapulting her into a new world. A land made of skyscrapers and cell phones. Fast cars and fluorescent lights. A land where magic isn't supposed to exist and anyone who wields it is the enemy. But after ten years of hiding, she's desperate to find a place where she can be free. Because all magic comes with a curse, and her curse is time—every ounce of power she uses strips days off of her life. The clock is winding down, and the only option left is to escape to the realm ruled by a man known only as the Beast. But the king of monsters isn’t what he seems. And the more Omorose opens her heart, the more she comes to realize that the only person she may need to fear is herself. One of my favorite things to do when working on a new book is to create an inspiration board on Pinterest! First, because I'm obsessed with photography and art, so I love incorporating that passion into my writing process. And second, because it's a great initial way to outline the mood I want throughout the story, the characters I hope to portray, and the settings I'm trying to visualize. So, of course, Withering Rose got its own inspiration board! The first few guest posts of my blog tour are diving into the different images that inspired my story, and right now we're taking a closer look at one of the two main settings—the fairy tale village that the beast calls home. The world of Once Upon A Curse is sort of a crazy blend of a fantasy world and a post-apocalyptic one. Imagine two parallel universes, the world we live in today and a fairy tale world full of magic. Got it? Okay, now imagine them colliding, causing a crazy, intense earthquake that fuses the two worlds together, creating an entirely new patchwork landscape. That’s the world of this series! 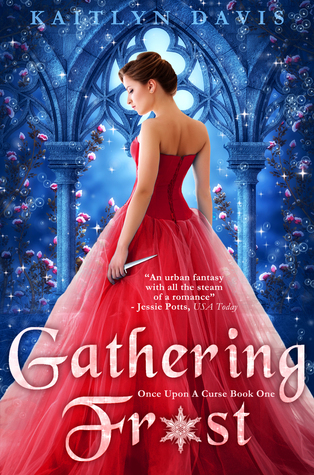 In the first book, Gathering Frost, our main character Jade lived in the fairy tale world. But in Withering Rose, Omorose runs away from the earthly military base where she lives, hoping that the magical realm of the beasts might be the place she belongs. This fantasy village that's shrouded in magic is nestled high in the mountains, overlooked by a majestic castle and a mysterious king. Thank you so much for joining my tour!! I so appreciate your support :) I hope your readers enjoyed learning about the fairy tale settling of Withering Rose, it was so much fun to dream up and write!